When your Spring hair goes grey? I have been confirmed as a bright spring 4 times since 1985, and I have lived happily with my palette. I'm now 57 and coloring my hair. At some point I'll let my hair go gray. What do you recommend that warm clients do with their warm colors and gray hair? Without knowing the color of your hair I'm going to assume that it leans towards golden blonde/light golden brown. Spring types can however have dark hair with fair skin. First of all I would say don't worry about it as the bright eyes of the Spring Season will usually support the full color palette even when your hair goes grey. 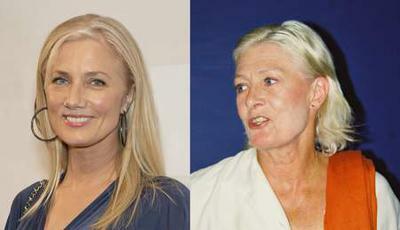 Take a look at the photographs above of Vanessa Redgrave and her daughter Joely Richardson - there's a huge likeness between mother and daughter and you can clearly see how the Spring palette has aged. But Vanessa still retains the warm skin and bright eyes that fully support the same color palette. When your are coloring your going-grey hair I would suggest that you have golden blonde highlights applied (even 2 or 3 shades) rather than an overall color which can appear harsh as it grows out. In this way you can adjust the amount and color of the highlights so that your hair lightens gradually and you won't have a sudden change. You might even decide to keep a few blonde or deep blonde highlights and apply them less frequently. This will retain the blonde look and you won't feel that you have to adjust your colors at all. Comments for When your Spring hair goes grey? When I let my gray grow out it was a lovely silver but mixed with the non-grey made my hair look dull. I have gone very light blond and wondered about using a silver toner but thought it might clash with my warm skin tones. Surely it won't clash as my gray hair is silver. I'm pleased to see I can still wear my spring colors with silver hair. Sounds lovely. I do enjoy reading about a successful transition into the wonderful shades that grey can bring. For the past year, I have been growing out my hair. I am a light spring and my colorist has been moving lighter and lighter over the years as I had a lot of grey. At 62, she suggested that I let my hair grow out and although it was stressful for the first few months, I am so glad I did. I love the freedom and the color. It is a light white blond color similar to the Vanessa Redgrave photo and I think it looks better than my natural or colored hair. What a pleasant surprise! Ladies, thank you so much for your comments here. Everyone's color direction is different and no-one can tell you exactly what will work for you when your hair changes color because we are all so different. And would you want to be told what to do? Of coure not, the way you feel is so very individual and it's a question of working through until you find a direction that feels right for you. I color because I work in a younger woman's profession (sales). If I didn't, I'd look washed out. It wasn't graying attractively, It turned mousy taupe especially in front. I left it for 10 years before coloring the first time. Post-color I'm a striking shiny brunette and it looks healthier than before with daily compliments. I can wear any hairstyle I want and it doesn't have to be short or edgy (not my style anyway.) I don't see myself stopping unless I'm old and sick. When my girlfriend recovered from cancer, she was glad to have her hair back. I'm a Bright Spring and stopped putting colour in my hair when I started to grey. I'm now a very nice salt and pepper that shines in the light. It's so freeing not to colour and so much healthier. As for my colours, I have found that going grey has not altered the ones I wear except grey which I never wore and now looks so great with my hair. A note from my hairdresser is to make sure that the cut is sharp and up to date so that the style doesn't age you. I have been told by color analysts that I am a Spring: Some say a warm spring and some say a bright spring. Yet I have been told by many that I do not look good with golden or red tones in my hair. My color savvy friends tell me that warmth in my hair makes my skin look red. They tell me overwhelmingly that I am much more flattered by my silvery white hair. I am thinking that perhaps I was not analyzed correctly in the past. When my colors were first done, the analyst had to Work very hard to tell if I was a spring or a winter. I am thinking that perhaps I have been a winter all along. I am also told that I do not look good in coral, peach, or Samon. I am thinking that I am really just a straight cool. Maybe I have been this all along. I am a breast cancer survivor. I used to colour my hair. Chemotherapy made me lose it, and when it came back it was naturally salt and pepper. I love it!! So freeing not to have to go for touch ups. Hey just happy to have it back. Although being bald was pretty freeing as well. Thank you! This answers my question. I can't see myself wearing anything else but spring colors because my skin seems to need it regardless of my hair. In response to your original question, my hair in youth was the kind of brown that looked dark indoors but appeared almost blonde outdoors. I'm tinting it brown with demi-color to cover gray, but it appears deeper than I was naturally.